Standing over the stove in a baseball hat and sweatpants, the writer Ayad Akhtar is making chai. It’s the perfect antidote to a misty grey afternoon in solitary central Harlem. Chai is volatile – boiling liquids, agitated tea leaves, stinging spices – but also reassuring, always finally settling into a deep brown. It is a blend of tradition and intuition; mood stirred together with habit. And it tastes different every time. Akhtar’s tea is strong and sweet. More impressively, it retains its heat for the hour that we discuss his writing, prizes, and current projects. Akhtar began his career in acting and screenwriting, but his debut novel, American Dervish (Little, Brown, 2012), turned swathes of post-9/11 American readers on to the pre-9/11 Muslim-American experience. Its narrator, the sensitive, 10-year-old Hayat, tells of his childhood curiosities, in particular the allure of Islam, which he gleans from the mystical stories his beloved aunt tells him each night. In his play Disgraced, which won the Pulitzer Prize in 2013, Akhtar’s protagonist is Amir, a South Asian-American corporate lawyer who has long rejected youthful notions of tradition, religion, and even ethnicity. The play’s five main characters are as distinct as cardamom pods from cloves; thrown into a pot on New York’s Upper East Side, they dance and hiss their opinions. Akhtar, who loves drama because it can be experienced in the body, insists that the play he spent four years writing came to life only when it did for the three hundred strangers sitting in the audience with him. “That’s the beauty and disappointment of the theatre,” he says. Akhtar believes his work is “reflective of a kid brought up on TV who spent all of college reading Ibsen and Beckett and Shakespeare.” And he gives his characters the same diversity of thought and experience. Guernica: You are described in various interviews as an actor, screenwriter, author and playwright. How do you see yourself and the work you do? 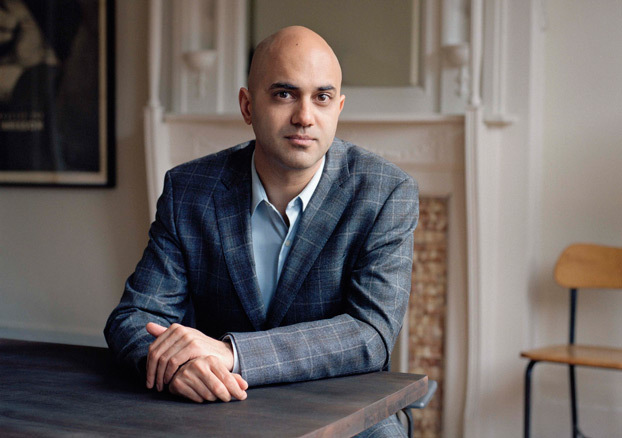 Ayad Akhtar: I think of myself as a narrative artist. I don’t think of myself as a novelist or screenwriter or playwright. All of those modalities of processing and experiencing narrative are obviously very different, and I’m not sure that I prefer any one to the other. I think the novel gives you the opportunity to have a kind of interiority that you can’t have in the theatre, which is pure exteriority. That pure exteriority, paradoxically, creates a much more heightened interiority for the audience. So if you want to really deeply touch the viewer or the reader, the theatre might be the most powerful way to do it. When it’s done right, obviously. When it’s not done right, it’s really boring. I’ve had very powerful experiences in movies, but seminal experiences in the theatre and as a reader of great novels are the things that have marked me most. Especially if you’re a writer of colour or if you’re a woman. Because if you fall into either of those categories, you’re expected to be writing of your experience. But if you’re not, then you can write about anything. It’s always perplexing to me, the ways in which my own autobiography has found its way into my work. And it’s often very misleading. I’ll take details, and they are working in the opposite way from which they existed in my life. The story begins to have its own demands: I need this, that, and the other, and I could use this thing, but I have to change it. And so that comes into the story, and it has the register of authentic life, and people think, of course, it must have happened exactly like that. But Disgraced did arise out of an actual dinner party that took place. You saw the potential in that experience. What I saw, subtly, was the way in which folks’ idea of me, even people who knew me very well, changed because I articulated certain things about my experience of being Muslim. And that struck me as an inherently powerful vehicle, or idea, for a story. About three years passed between that dinner party and me even having the thought that I could write it as a play. And when I went back to do that, I had this thought process: OK, here are these characters, and a dinner party, and I remember what we talked about, but I can’t have them talk about those things, so what happens if we just put these things into motion? A very early draft of the play was much more talky, and not as driven by back-story, by onstage needs, things that people want from one another. That was something that began to evolve over a very long process. I finished writing Disgraced at the beginning of 2009 and it had its first production in 2012, three years later, and I continued to rewrite it through London [in 2013]. So it was basically four years of really, really writing, constantly writing. And I’d say for the first two and a half years I didn’t know what the play was about. I was just writing, and Amir would keep talking, and I would keep trying to understand what in god’s name he was saying. And it was so strong, and it just kept going, and then I finally got it. But it really took me a whole production to understand that. It must have been helpful to have a character yelling at you as you wrote your way into the story. Can you talk more about the workshopping process? I’ve been in the theatre for most of my life, I just had never written a play. I’ve written a lot of screenplays, long-form fiction. After I finished Disgraced, I actually wrote three other plays back to back, so in eight months, I wrote four plays. And then I had the first reading of Disgraced. The work that’s now coming out all comes from that time, and has all been through workshop, and first production, and I did huge rewrites before we went to Lincoln Center. I’m still coming to understand my own process as a dramatic writer. But the thing I’m discovering is that there’s no substitute for it being on its feet. I could not have imagined the quantum shift in perspective that happens when I’m experiencing the work as embodied by a group of actors, as opposed to imagining it on the screen, on the page. [Seeing it is understanding] its capacity for impact, and understanding what impact means, what action is. This interview first ran in Guernica, an online magazine of art and politics. Read more at guernicamag.com, and read more pieces by Aditi Sriram at aditisriram.com. Photo: Ayad Akhtar by Nina Subin.